MASTICATOR: LAMB WEEK CONTINUED: A Fennelbration! 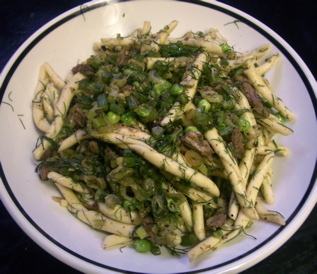 Filei Calabresi with lamb, young fennel, peas, pecorino romano and olive oil. This was just about the end of the lamb. There are a few bits left that may be involved in a breakfast, but the shoulder has been picked pretty clean by now. It's now looking forward to its retirement to the stock materials bag in the freezer. Really nice. The fennel is very young, so its much subtler, with a sweetness that the peas helped bring out. And filei is a really nice shape for stuff like this. It is a very loose twist, with some variations in thickness that add nice texture. I used La Bottega della Pasta brand from the good italian importer I have previously mentioned, which has all of those characteristics that good dry pasta is supposed to have, and seemed very fresh compared to anything from the supermarket. I hate the supermarket. Fennel and almond tart; salad with mustard/anchovy dressing. I had previously baked a peach pie with an almond flour crust(1 part almond flour to 1 part white whole wheat) and, thanks to a change of heart about a lattice topcrust, I another pie's worth of crust dough in the freezer. I was trying to think of something to do with the rest of the fennel all day that would not require shopping and would not be a fennel salad. So I cut off a little hunk of the frozen dough and decided to make a tart. I cooked down 1.5 cups of chopped fennel stems and fronds and one large chopped shallot in olive oil, then pureed it with 1 Tbsp of pecorino romano, salt and black pepper. Then I sliced the fennel bulbs thinly and sauteed them lightly to wilt them a little. In the meantime, I rolled out the tart crust and laid it in the bottom of a small metal baking pan. Using a 3.5" dia. stainless steel ring, I cut a circle of rolled dough(leaving the ring around the cut piece) and used the extra dough to build up the sides of the tart on the inside of the ring, making sure the joint between bottom and sides was sealed. Into the bottom of this unbaked crust I spooned the fennel/shallot/cheese puree and smoothed it out so it was even. On top of the puree I layered the thin fennel bulb slices so it looked as pretty as I cared it to look and gave it a sprinkle of sea salt. Then I stuck it in a 370˚F oven and baked it until the crust was nicely browned. The salad was simple: French Crisp lettuce and purslane leaves. A dressing made from walnut oil, an anchovy(also from the italian importer, very good quality), a few capers, a spoonful of mustard, a dribble of sherry vinegar, and another dribble of chestnut honey; all whizzed in the tiny processor attachment to my immersion blender. 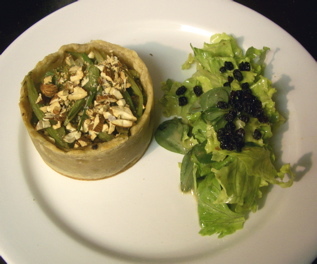 A few currants on top of the salad, and some crushed roasted, unsalted almonds on the tart. This was really good. I love savory tarts(but don't make them often enough) and this was a good one. Powerfully fennel-y, it played really well against the salad dressing. And the crust held together really well - I lucked out with the fennel puree being on the drier side. I also baked a loaf of semolina bread, which has the best taste and texture of any bread I have made. But it got stuck on the peel and ended up kinda ugly. I tried to take a picture but it covered itself with a jacket. It will be in a panzanella tonight. Oh yeah, and you can still vote for me to go to Napa if you want. And thanks to those who have already. Also vote for Not eating Out in NY and Butter & Oil, please.